On the 1st of February we were alerted of Enkikwe’s brush with lions when a concerned Benjamin, the Head Keeper at the Ithumba Reintegration Unit, called Angela at 10.00am. Enkikwe is part of the group of orphans led by Laragai who have been more independent recently, not unusual for elephants of their age. Five year old Laragai had begun the habit of opening their stockade gate at night, housing she, Kithaka, Barsilinga, Lemoyian and Garzi. When the six new arrivals came from Nairobi in December, Boromoko, Sirimon, Sokotei, Enkikwe, Siangiki and Olsekki decided to join up with Laragai’s little splinter herd as well, and they would spend nights outside of the stockade, sometimes wandering further afield and leaving the company of the dependent orphans and their Keepers, joining older Ex Orphans on such excursions. This herd of eleven good friends have grown up together in the Nursery and know each other very well; Enkikwe and Siangiki in particular are best friends and remain inseparable. The day of Enkikwe’s mauling was one of those days when Laragai’s herd chose to head off in a different direction to the Keepers and dependent orphans, and they headed towards the Kalovoto dry river. Later that morning at around 8.00 am, the Keepers heard trumpeting and a fracas coming from the direction of the dry river bed, but this is not unusual at Ithumba with numerous elephants in the area and plenty of action and noise heard daily, so they thought nothing of it. Later the keepers and their dependent charges met up with Ex Orphans Makena, Tumaren and Rapsu, gently escorting a mauled Enkikwe back to the stockades, with the rest of Laragai’s herd trailing behind. On closer inspection it was evident Enkikwe had been badly mauled by lions, and that one lion had latched onto his throat while the other must have attacked him from behind. It is a miracle he survived and that he is alive today, and this can only be because of the older Ex Orphan’s Makena, Tumaren and Rapsu intervening. Their screaming and trumpeting and tearing the place up must have unnerved the lions enough to save Enkikwe’s life. 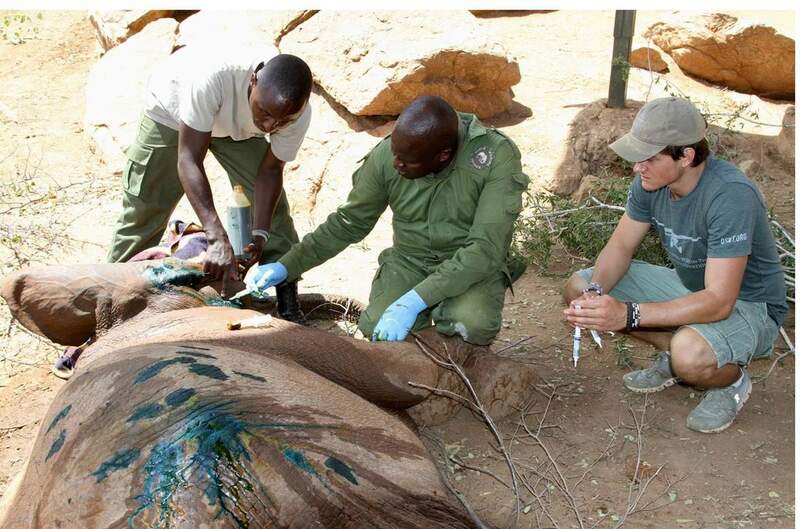 We flew the vet Dr. Poghon in to treat him immediately and we will have to take each day as it comes, but we are very fortunate indeed to have Enkikwe still with us today, as the Tsavo lions are formidable, and they have been known to kill wild elephants much older than Enkikwe. We were particularly worried about one wound on his back leg where ligaments have been compromised on the knee and in cleaning the wound his bone was visible. One week on and the wounds around his neck and back have healed well, but we will need to keep a close eye on the deep leg wound and for any sign of infection from such a lion bite. The leg is still swollen but the is no sign of pus yet which is a good sign. The concern beautiful Makena showed for Enkikwe that day is remarkable; firstly saving his life, then gently and sensibly bringing him back to the stockades, to then keep returning throughout the day to check up on him in the stockades. All the whole she escorted the rest of his herd, providing them with protection, comfort and guidance after such a harrowing experience, further affirming just how extraordinary elephants, and our orphans in their abstract family groups, really are.